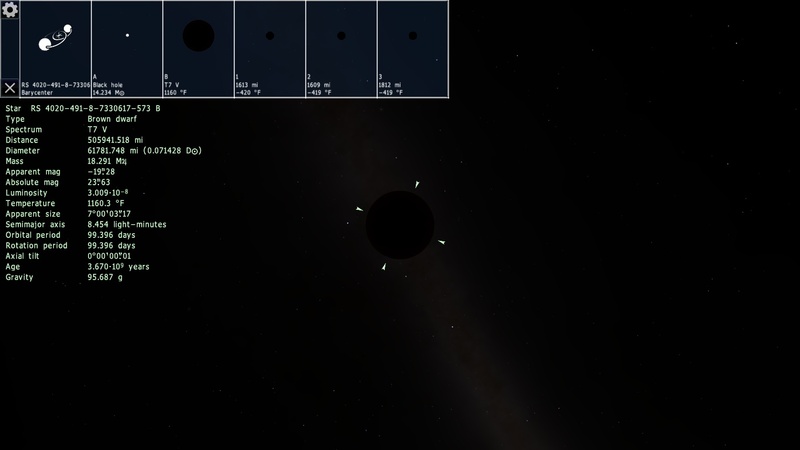 This is a "brown" dwarf with a black hole neighbour. This "brown" dwarf is obviously emitting no light at all, not even a pink glow. Dwarves like this are called black dwarves, and are older than the current age of the universe. Can anyone explain this "black dwarf?" I don't know much about brown dwarves so sorry if this question is obvious or just time wasting. Have YOU found any of these? And by the way, why is the frickin' magnitude negative? IanTheGuy, You can find these brown dwarfs literally almost everywhere. They are really cold, so they emit little to no light. So, no black dwarf. What these users have said exactly. Black dwarves are just extremely old White dwarves, which are way more massive than any Brown Dwarf. Black dwarves live in a stellar 'hood. Brown dwarves live in a stellar barrio. Brown dwarfs do emit light, it's just in the infrared, not visible. Same for black dwarfs, but as others have noted, brown dwarfs and black dwarfs are totally different objects -- different compositions, mass, and formation process. There are no black dwarfs in SE because the universe is not old enough for them to exist yet. It takes a long time for white dwarfs to cool down! So black dwarves are white dwarves that cooled down to the temperature of the cosmic microwave background (CMB) and thus are invisible. Brown are brown. White go to black. universe is not old enough for them to exist yet. If this was a black dwarf, there would be visible gravitational lensing, since they are just cooled white dwarfs. In the distant future, when black dwarf exist, novice space travelers may mistake them for black holes, since they will be completely dark and have some lensing. Experienced travelers would be less likely to make the mistake, since they know that black holes produce more intense gravitational lensing.